It was a huge day in space today! The Soyuz arrived with Dan, Anton, and Anatoly and Expedition 29 finally has a full crew of 6! These guys are an awesome bunch and I really regret only having a few days with them to share the space station. We’ve done everything we could to help start the handover via videos sent to the ground and special conferences. Now we push everything into full afterburner to make every minute count. At this point this morning, they had already docked to the ISS and we were waiting for the pressure leak checks to be completed. They seemed to go on forever! 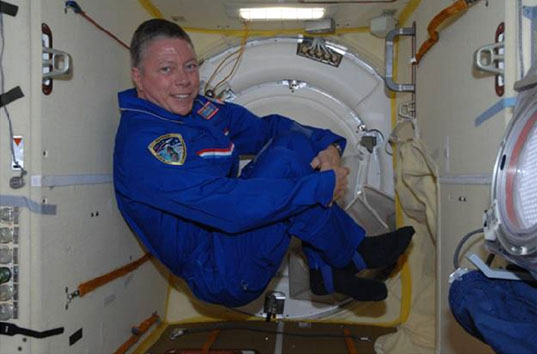 All the action was on the Soyuz located on the other side of the hatch behind me, so I could do was hang around and wait. 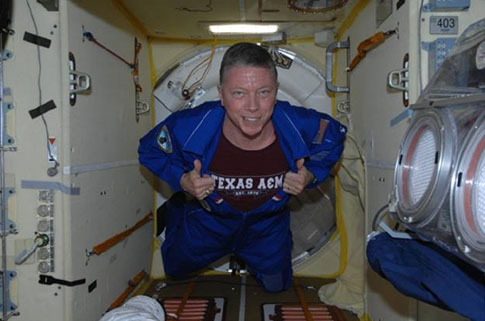 Of course there’s always time to show some Aggie colors! With a few extra tugs, the hatches are open at last and some happy guys come tumbling into their new home for the next 4.5 months. Our first dinner as a 6-person crew was a time to celebrate. 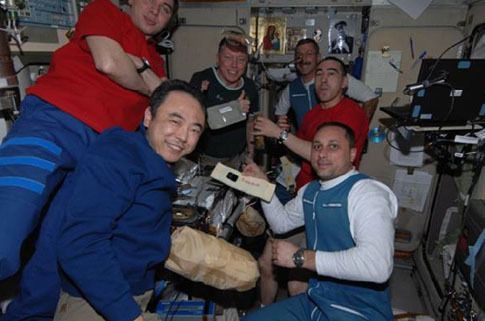 It was also training time as we shared some of the finer points of space cuisine in this 5-star do-it-yourself restaurant with an awesome view of the galaxy. There were a lot of huge highlights to the day. From a professional side, the arrival of these guys means we can finally stop preparing to leave the Space Station in a preserved state without a crew. A monumental effort on the ground has been dedicated to reducing the risks associated with this possibility and we’re all very glad that is not a plan we have to execute. Another highlight was finally sharing space with Dan on orbit. He has tolerated sharing housing with me in Russia for the last 2 years and we’ve spent a lot of late nights studying for classes and talking about being up here together someday. 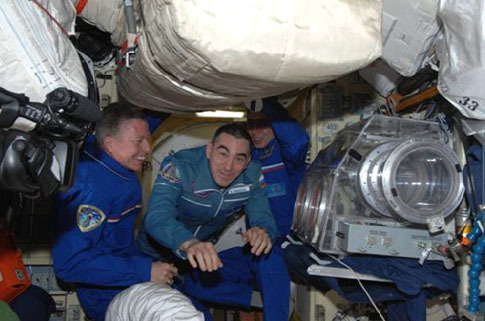 The best part of today, though, was finally seeing first-time space farers, Anatoly and Anton, on orbit. They have dreamed and worked hard for many years for this day and I’m excited to have shared it with them. That brings to mind an old quote which resonates with me and has served as a call for action for many years. Dream big! Then get to work! !